Margaret and I visited Istanbul for five days this past summer, staying in Sultanahmet, and visiting The Bazaar Quarter, Seraglio Point, and crossing the Golden Horn into Beyogle. Sultanahmet is the home of two of the most important Mosques in a city filled with them: the Blue Mosque (Mosque of Sultan Ahmet 1), and the Haghia Sophia Mosque, the "church of holy wisdom." Except for a boat ride on the Bosporous, we accomplished everything we wanted to do and see in our time there. 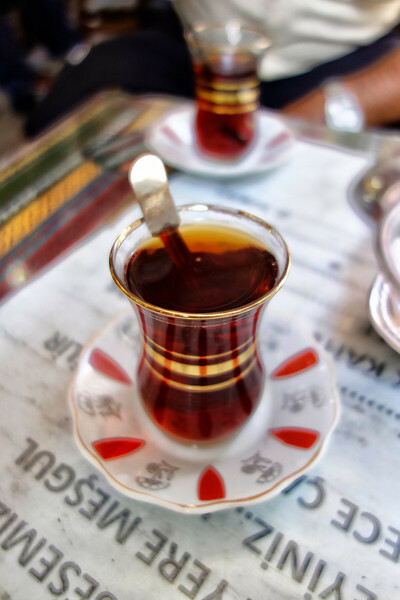 A stranger, whom we stopped to ask for directions to the Grand Bazaar, took us to his favorite haunt for tea, after which he led us to the bazaar. He spoke no English, I no Turkish, so we communicated haltingly in French! This photograph is Apple tea, very popular here.